Summary : A very light and delicate taste, with a hint of sweetness too. Not exceptionally flavorful, but if you are looking for a "light tasting green tea", this tea is likely to be right up your alley. Review : Don't let the name fool you. Adagio Teas White Monkey is a green tea, not a white tea. The reason I mention it is that I had ordered this tea about 6 months prior to tasting it. And since the little tin the leaves arrive in says "White Monkey", I naturally presumed, stupid me, that this was a white tea. Not a green tea. This of course changed once I opened up the canister and noticed the large green leaves. And with all this confusion now settled, I sat back and waited for my brew of White Monkey Tea to be ready. The leaves of this tea are huge. You'll need to use more than 1 teaspoon of leaves per cup, simply because it will be difficult if not impossible to "pack" your teaspoon full of these leaves - unless you want to crush them. Here is how Adagio Teas explains this tea on their website : "The young leaves and unopened buds are carefully gathered and processed exclusively by hand. 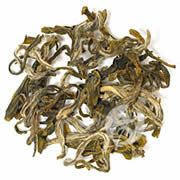 The result is a tea that appears intricately woven with large and beautiful white tips. It produces a very light cup that is noticeably sweet, and infused with a fresh, delicate scent." The leaves of this tea are very high quality. No argument there. However, to be honest, I really did not find much sweetness in this tea - despite playing around with several different measurements of leaves and water temperature. Don't mistake me...there is some sweetness. But that sweetness is very, very "light", for lack of a better word. Indeed, "light" is how I would describe this tea in every way. It has light colored, if somewhat huge, leaves. The tea color itself, once brewed, is a very light. And the taste of the tea is also very light - with the distinct taste of green tea. Recommendation : Yes and Maybe. It depends on the person, really. If you like the taste of traditional loose-leaf green tea, you'll definitely like this one, although the taste is a bit on the "lighter side." On the other hand, if you are looking for a tea with a more powerful and robust flavor, then you'll want to find another green tea to try. I give this tea three stars since I just wasn't wild about the "lack of taste" in the tea, despite the high-quality leaves used. But if you like lighter teas, this is definitely a 4+ star tea. Brewing Instructions : Pour 6 ounces water that has a temperature of 180 degrees (not boiling! ), over about 1.5 teaspoons of green tea leaves. You want to use more than 1 teaspoon of leaves with this tea because the leaves are quite large (which throws off precise teaspoon measurements). Let steep for 3 minutes.